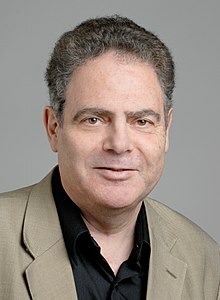 Bertrand Meyer (/ˈmaɪ.ər/; French: [mɛjɛʁ]; born 21 November 1950) is a French academic, author, and consultant in the field of computer languages. He created the Eiffel programming language and the idea of design by contract. Bertrand Meyer received a master's degree in engineering from the École Polytechnique in Paris, a second master's degree from Stanford University, and a PhD from the Université de Nancy. He had a technical and managerial career for nine years at Électricité de France, and for three years was a member of the faculty of the University of California, Santa Barbara. From October 2001 to early 2016, he was professor of software engineering at ETH Zürich, the Swiss Federal Institute of Technology, where he pursued research on building trusted components (reusable software elements) with a guaranteed level of quality. He was Chair of the ETH Computer Science department from 2004 to 2006 and for 13 years (2003–2015) taught the Introduction to Programming course taken by all ETH computer science students, resulting in a widely disseminated programming textbook, Touch of Class (Springer). He is currently a Professor at the Polytechnic University of Milan, where he arrived with an ERC Advanced Investigator Grant project. Meyer's other activities include associate professorships at Innopolis University and, in 2015–16, a Chair of Excellence at the University of Toulouse. From 1998 to 2003 he was adjunct professor at Monash University in Melbourne, Australia. He is a member of the French Academy of Technologies. He is also active as a consultant (object-oriented system design, architectural reviews, technology assessment), trainer in object technology and other software topics, and conference speaker. For many years Meyer has been active in issues of research and education policy and was the founding president (2006–2011) of Informatics Europe, the association of European computer science departments. Meyer pursues the ideal of simple, elegant and user-friendly computer languages and is one of the earliest and most vocal proponents of object-oriented programming (OOP). His book Object-Oriented Software Construction is widely considered to be the best work on presenting the case for OOP. [dubious – discuss] Other books he has written include Eiffel: The Language (a description of the Eiffel language), Object Success (a discussion of object technology for managers), Reusable Software (a discussion of reuse issues and solutions), Introduction to the Theory of Programming Languages and Touch of Class. He has authored numerous articles and edited conference proceedings. He is the initial designer of the Eiffel method and language and has continued to participate in its evolution, and is the originator of the Design by Contract development method. His experiences with object technology through the Simula language, as well as early work on abstract data types and formal specification (including the Z notation), provided some of the background for the development of Eiffel. Eiffel has been influential in the development of other languages including Java, C# and Python. In 2005, Meyer was the "senior award" winner of the first AITO Dahl-Nygaard award. This prize, named after the two creators of object technology, is awarded annually to a senior and a junior researchers who have made significant technical contributions to the field of Object Orientation. Meyer has received honorary doctorates from ITMO University in Saint Petersburg, Russia (2004) and the University of York, UK (2015). In 2006, Meyer received the Software System Award of the ACM for "impact on software quality" in recognition of the design of Eiffel. He is a 2008 Fellow of the ACM. He is also the 2009 recipient of the Harlan Mills Award of the IEEE Computer Society. On 28 December 2005, an anonymous user falsely announced Meyer's death on German Wikipedia's biography of Meyer. The hoax was reported five days later by the Heise News Ticker and the article was immediately corrected. Many major news media outlets in Germany and Switzerland picked up the story. Meyer went on to publish a positive evaluation of Wikipedia, concluding "The system succumbed to one of its potential flaws, and quickly healed itself. This doesn't affect the big picture. Just like those about me, rumors about Wikipedia's downfall have been grossly exaggerated." ^ "Bertrand Meyer's Bio". Bertrand Meyer's technology+ blog. Retrieved 7 March 2019. ^ Scientist to receive ACM award for development Eiffel computer language: ACM Press release, 29 March 2007, at . Wikimedia Commons has media related to Bertrand Meyer.